Home » Beyond Surrender. Australian Prisoners of War in the Twentieth Century. Beyond Surrender. 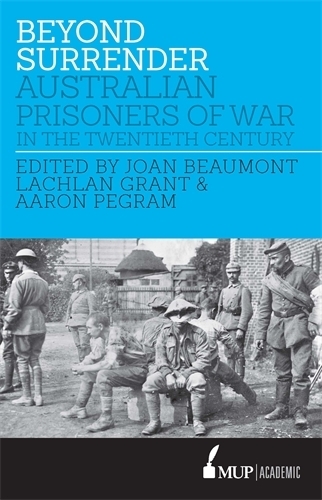 Australian Prisoners of War in the Twentieth Century, edited by Joan Beaumont, Lachlan Grant and Aaron Pegram arose from a 2013 conference which challenged many of the entrenched assumptions of captivity. As well as illuminating unknown or forgotten aspects of the Australian prisoner of war story, the fourteen chapters burrow under the barbed wire to dissect long enshrined myths and their authors, ranging from early-mid to late career historians, also present a diverse Australian captivity experience. As the editors acknowledge in ‘Remembering and rethinking captivity’, their perceptive introductory chapter to Beyond Surrender. Australian Prisoners of War in the Twentieth Century, Australian historiography and public attention have long concentrated on captives of the Japanese. While that has resulted in a significant reshaping of the ‘national collective memory’, an unfortunate consequence has been on-going neglect of prisoners from other wars. Although it includes four chapters dealing with Japanese imprisonment, Beyond Surrender redresses the imbalance by considering wartime confinement across a broad range of conflicts and theatres. Such diversity emphasises the universality of captivity. For instance, Kate Ariotti’s powerful ‘“At present everything is making us most anxious”: Families of Australian prisoners in Turkey’ may focus on the relatives of Ottoman Empire prisoners, but their experiences also relate to next of kin from other conflicts: all waited, all endured agonies of the unknown, all tried to do whatever they could to alleviate the misery of their loved one, and many joined supportive networks. In his ‘“I hope you are not too ashamed of me”: Prisoners in the siege of Tobruk, 1941’, Karl James demonstrates that Allied and Italian prisoners shared similar emotions on capture and, regardless of nationality, some prisoners were treated with dignity and others were maltreated and humiliated. A major theme of Beyond Surrender is how prisoners fit into Australia’s ‘national discourse about war’ and, in particular, into the Anzac legend. Prisoners of the Japanese were eventually embraced by it but there was continuing reluctance towards captives of the Reich because it was widely believed that they had suffered less than their counterparts in the Asia-Pacific theatre. As Seumas Spark highlights in his study of repatriates from Italy, this was partly because of their own agency. By sending home cheery letters and downplaying hardships, they fostered a breezy impression of camp life that was at odds with the fighting spirit of the Anzac legend. This is another example of universality as the same could be said of repatriates from Germany and those liberated from European camps. In her detailed account of the decades-long attempt to provide adequate compensation to former prisoners of Japan, Christina Twomey shows that, while families, support organisations and, more recently, members of the public exhibited compassion towards former prisoners, the Australian government did not. The Prisoners of War Trust Fund, available to ex-prisoners of Japan and the Reich, treated many applicants with suspicion and even contempt, almost forcing them to beg for hardship assistance. After its closure, the government only offered genuine compensation to ex-prisoners of Japan after all costs had been measured, medical research had presented irrefutable results, and other nations had given due recognition. Prisoners of the Reich, however, were initially excluded because of the lingering belief that they had had an easier time. That delayed recognition indicated a significant change in public and civic compassion: as well as acknowledging trauma, there was no longer discrimination based on ‘degrees of suffering’. All prisoners of war are considered equal in Australian eyes and now take their rightful place in national memory and commemoration. A significant feature of Beyond Surrender is ‘myth busting’. In his ‘Behind the Colditz Myth. Australian Experiences of German Captivity in World War II’, Peter Monteath challenges fundamental misconceptions by focusing on the realities of incarceration for other ranks who were obliged to work. He also touches on the dangers presented by Nazi security and the harrowing ordeal of the forced march. Aaron Pegram demonstrates that the ‘Colditz Myth’ generalisations have been erroneously applied to Australian prisoners of Germany in the First World War and proves that the popular escape narrative is not representative of their experience. Jennifer Lawless challenges continuing perceptions of Ottoman cruelty to their captives which had been extrapolated from only a handful of sources. While Lachlan Grant (who contributed two chapters to Beyond Surrender) looks at the reasons for and consequences of unrestricted submarine warfare and Jeffrey Grey contextualises captivity within the Korean War, people are at the heart of this collection. In her survey of the development of the Red Cross ideal and work of the Australian Red Cross, Melanie Oppenheimer emphasises the significant role the organisation played in ameliorating the impact of wartime confinement on prisoners and families. In giving voice to veterans of the Korean War through interview extracts, Jeffrey Grey provides a striking example of putting the person into the narrative. Lachlan Grant looks at prisoner interaction with the local population in ‘Breaking barriers: The diversity of prisoner-of-war camps in Japan and Australian contacts with Japanese civilians’ to reveal the effect of contact with civilians who similarly suffered deprivation and hardship in the end stages of the war. Beyond Surrender’s social dimension is further reinforced by several authors introducing their chapters with personal vignettes and quotes. The central theme of the Japanese chapters is survival. In ‘Officers and men. Rank and survival on the Thai-Burma railway’, Joan Beaumont points out that while egalitarianism may be one of the fundamentals of the Anzac legend, there was nothing equal about the hardships endured by the prisoners of Japan and examines the factors that resulted in a significantly lower mortality rate for officers. In her case study of Changi, Lucy Robertson considers the Japanese requirement for officer prisoners to manage discipline within their own ranks including meting out punishments for looting, scrounging and trading to acquire food and other supplies. Although officer/men relations were severely damaged, strict adherence to discipline in hygiene and sanitation, for example, did maximise survival. In ‘Breaking barriers’, Lachlan Grant highlights the extremes in camp conditions throughout Japan and, interestingly, given Robertson’s attention to censure for pilfering and trading, points out that in American-dominated prison camps, Australians were thrown into a culture where theft was rife and capitalism was king. Beyond Surrender challenges entrenched assumptions of captivity and illuminates unknown aspects of the Australian prisoner of war story. It is rich, nuanced and readable. Highly recommended.